The Mr. Crappie line of knives is the result of a collaboration between Wally Marshall and Buck Knives. 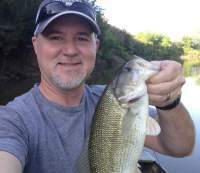 The former is one of the best-known Crappie fisherman in North America, which earned him the nickname Mr. Crappie, while the latter needs no introduction. The Slab Slinger is the fillet knife of the line and can definitely be used for more than just Crappie. The knife is corrosion resistant, so you don’t have to worry about it getting wet and the 6 1/2” blade is crafted from 420HC steel. This provides it with not just excellent strength, but also ensures superior edge retention and enhanced corrosion resistance. The overall length of the Slab Slinger is 12-1/8” and it weights a comfortable 3.5 oz. Because the knife is so sharp safety is very important, which is why the grip has to be good. The Slab Slinger delivers in this department with a handle that has a deep finger groove that provides a more secure grip. The handle is also comfortable enough that you won’t be left with any hand or knuckle pain afterwards. In addition, the nylon and tactile feel overmold of the handle gives it a quality feel. The knife is comfortable enough to use without gloves, but still offers a decent grip while wearing gloves or when your hands get wet. The grip is also slightly longer than typical fillet knives, which adds to the comfort level. The Slab Slinger is not just a sturdy knife, but also a versatile one thanks to its full tang construction and flexible trailing point. Even tough scales can be poked through with ease, courtesy of the tip edge while the main edge is specifically designed to enhance control and comfort. Finally, the Slab Slinger also comes with a convenient injection molded nylon sheath to keep the knife secure and to protect yourself from injury. The sheath even has drainage holes that are designed to reduce moisture buildup. 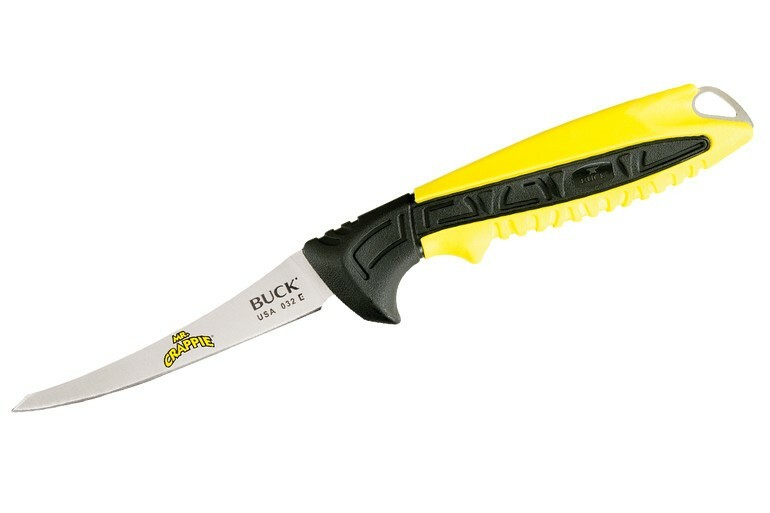 Buck Knives is an American brand that carries a lot of weight and the Mr. Crappie line certainly doesn’t do anything to diminish this. The design and colors of the knife ensure that it not just functions well, but also looks good.